This exquisite champagne merchandising POS display is a stand out in stores. However, two brands present in a display, in this case it’s world class champagne companies Moet & Chandon and Krug, should not be mixed. This display is a clash of two brands, a mistake made by merchandisers who set up the display in store. This display was photographed in a duty-free area in South-East Asia. While both companies are owned by luxury goods powerhouse LVMH and both companies have over 300 years experience in marketing their products to customers, two brands shouldn’t be displayed together. Positively, this merchandising display has used a simple yet elegant design, using colours that ooze the words, luxury, indulgence, and desire. Colour: Here, the deep purple colour represents wealth, extravagance, royalty and power. When people see this display, they automatically begin to admire the colour used together with the champagne bottles. The gold detailing is another addition to the luxurious look. Custom brand placard: Customised placards are helpful in branding this champagne retail display. The ‘KRUG’ sign is eye-catching, but would be more so if the sign was not behind two bottles. Further, the colour of the sign is a different shade of purple which makes it stand out. The custom font aligns with the brand image and values of high-end and luxury. The white colour on the dark background also is another tool which makes the whole display more noticeable. Lighting: POS retail displays would not be successful without the correct lighting up the product on display. Your display does not want to be dull. Lighting helps all the chosen colours to pop! The lighting in Moet’s merchandising display is bright and definitely attracts attention to the liquor packaging design especially. Merchandising is vital in creating a successful display in retail stores. To make sure you don’t make the same mistakes on your own display, see these tips below. Relevance to Brand Image: Moet and Krug alike are exclusive, high-end, and elegant brands. Their champagne is often used for special event celebrations. To create a cohesive retail display, finding your brand image is the most important thing to consider. The packaging on the champagne bottles themselves include a prize-like ribbon print, making it look like an award-winning champagne. Features like the colour of the display itself, also create a solid image and meaning behind their display. 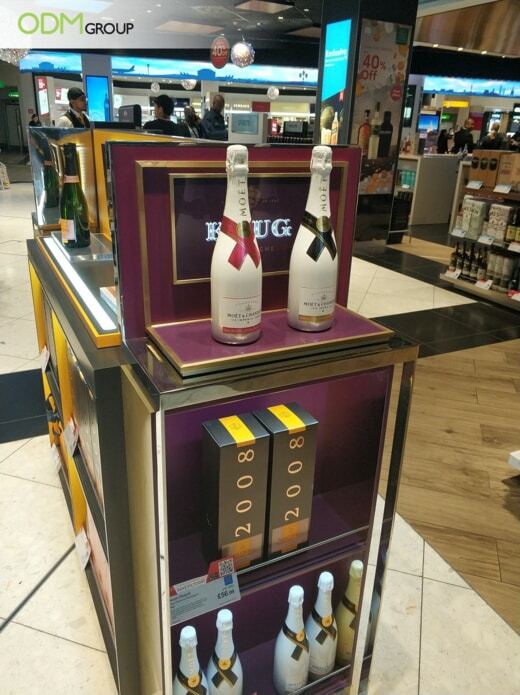 This display would be more effective if the display cabinet was also Moet, not Krug, or vice versa. The champagne POS display would confuse potential buyers by having two brands in the one display. This is not a clear brand image display. Target Audience: By creating a target audience, you don’t lose track of what you’re selling. However, you don’t want to limit your display to just a small group of people. In this display, Moet attracts people who desire wealth. At the same time, people who already enjoy these types of products are sure to be interested in this display. 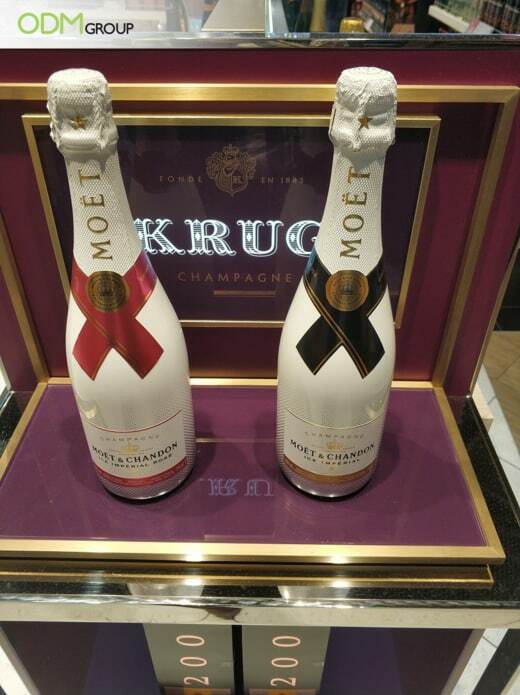 Multiple products: There are multiple items showcased in Moet’s merchandising POS display. This gives customers an idea about the range of products the brand has. It shows more exclusive products, like the collectable 2008 champagne bottles exclusive to the year. However, there are multiple brands, which is something to avoid. Check Up On Store Displays: To make sure your POS display doesn’t display two different brand, be sure to make sure merchandisers set up your display correctly. This display is ironic as these brands are potentially competing. The ODM Group can help you design and manufacture not only the display set, but the packaging for the champagne bottles themselves. We want to help you reach your marketing goals in any way we can. Custom retail merchandise should be exciting and eye-catching. At ODM it is our job to design a display which aligns with your brands image. For more blogs and ideas about merchandising POS displays and liquor packaging designs, click on the links below. This classy bottle display shows Bottega have a clear vision with this display and is a show-stopper in stores. Don’t settle for average, make a real difference in your company merchandising. This giant Ferrero Rocher display is absolutely stunning. It’s creative, yet also a practical stand where customers can choose a product to buy. Looks great and serves a unique brand purpose! Looking for a seasonal display? This huge Christmas tree made out of wine bottles lights up! Creating everyones attention, no one will miss it. This store displays a multitude of custom branded products in their store in Tokyo. They have their penguin mascot on all items for sale. What great brand exposure! This simple retail display is a great marketing strategy. It is clearly visible in store, has easy access to the fish jam jars. If this is what you’re considering for your next retail display continue reading by clicking the link!